Our CEO, Pierre Gabriel Côté, will be in France from June 19 to 25 with David Brulotte from our Paris office to take part in the International Paris Air Show – Le Bourget. Montréal, international video game hub, is renowned for its talented workforce. Numerous drugs were developed in Québec, including SINGULAIR®, 3TC/Epivir® and FluLaval®. 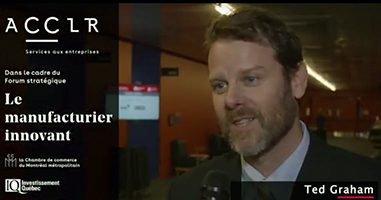 To stay aware of new tehcnology be an active tryer of new things, like Ted Graham, head of open innovation at General Motors and an inspiring speaker at our innovative manufacturing forum held on April 7 in Montréal. Google, Microsoft and other ICT giants can count on Québec’s expertise in artificial intelligence, one of our many promising growth sectors. As a centre of knowledge and discovery, Québec is home to the largest life-sciences cluster in Canada and one of the biggest in North America. Always breaking new ground, Québec is the Canadian leader in advanced transportation and sustainable vehicle technologies. Mr. Guy LeBlanc, the newly appointed President and CEO of Investissement Québec and member of the Board of Directors, will take office on April 23. The project involves expanding the company’s Saint-Eustache facilities on Montréal’s North Shore, in addition to acquiring specialized equipment and Industry 4.0 technologies. France-based Axionable, which specializes in data and artificial intelligence (AI) strategies for business, is taking advantage of Co-founder and CEO’s Gwendal Bihan’s presence at the World Summit AI to announce the opening of a laboratory in Montréal. This leader in integrating leading-edge technology for the entertainment industry is a constant inspiration, nationally and internationally. Avenue Code, a top IT consulting firm specializing in end-to-end solutions for e-commerce, announces the opening of a subsidiary in Montréal. Lufthansa Technik AG, one of the leading providers of technical aircraft services in the world, is expanding its Montréal site for maintenance and repair of state-of-the-art aircraft engines. Keep updated on new businesses setting up in Québec and issues affecting our major sectors, and receive our press releases.